The story of this beautiful, delicate swift fox is the story of an animal, which almost didn't make it back from the edge of extinction. The swift fox was considered so common on the Great Plains of Canada and the United States, that its gradual disappearance was almost overlooked by conservationists and governments. The last swift fox was sighted in Saskatchewan in 1930, and in the space of a few decades, it had disappeared from most of its range in Canada. In the United States it had been wiped out of 90% of its range by the 1990s. The swift fox is a small, delicate fox, the smallest wild canid of the North American Continent, and a cousin of the western desert kit fox. It is about the size of a cat, standing 12 inches (30 cm) in height, and 31 inches (79 cm) in length from head to tail. It weighs approximately 5 lbs (2.3 kg). The male, or dog fox, is larger than the female, known as a vixen. They are a dark buff gray in color with a yellow-tan color across their sides and legs. Their throat, chest, and belly are pale yellow to white. They have black patches on their muzzles and a black tip to their tail. Their ears are noticeably large. The swift fox gets its name because it can reach speeds of 25 miles (40 km) per hour. Swift foxes are considered nocturnal, doing most of their hunting in the evening, through the night and into the early morning hours. Although they are very sociable, they keep one mate throughout their lifetime. They don't appear to be territorial, with many of their home ranges overlapping. Their dens are used daily, all year long. The swift fox is omnivorous and has a varied diet of rabbits, mice, birds, reptiles, insects, berries, and seeds. Its main source of food consists of prairie dogs and ground squirrels. Predators of the swift fox are coyotes, eagles, hawks, and man. Coyotes are the primary predator of the swift fox. can live up to 10 years in the wild. In captivity they have been know to live for 14 years. When settlers first moved west onto the Great Plains, the swift fox could be found ranging north to south from central Alberta, Canada, to central Texas, and east to west from western Iowa and Minnesota through New Mexico, Colorado, Wyoming and Montana. The swift fox occupies a specialized niche in its environment, relying on the open, rolling short and mixed-grass prairies on which buffalo range, prairie dog burrows, and the prairie dogs and ground squirrels on which they feed. After the near annihilation of the bison, the grasses grew tall and the little swift fox was unable to scan for predators. Mass poisoning of prairie dog towns to make way for agriculture eliminated the swift fox's main prey of prairie dogs and ground squirrels. Most devastating was the loss of prairie dog burrows used by the swift fox for their whelping dens and escape from predators. 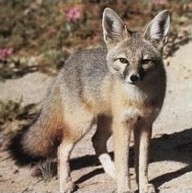 Without the safety of the burrows, the swift fox became easy prey for coyotes and golden eagles. Slowly the swift fox was sighted less and less. Today they are considered to be "endangered" by the Committee on the Status of Endangered Wildlife in Canada. Private and government efforts are making gradual progress in reintroducing the swift fox to some of their natural range. 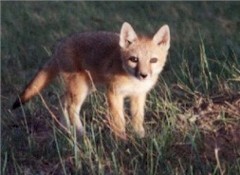 In the United States the swift fox was not considered endangered under the federal Endangered Species Act, although only 10% of its original population survived in isolated areas. In 1995 the U.S. Fish and Wildlife Service said that the swift fox should probably be listed, but that the listing could put restrictions on the way the land was used. Ranchers and farmers were afraid they could no longer use the land designated to the swift fox. The Swift Fox Conservation Team was established to look into ways to slow down the decline of the existing swift fox populations. Northern Prairie Wildlife Research Center is helping in the reintroduction of swift foxes on the Blackfeet Tribal lands in Montana, and giving advice in the re-introducing the swift fox into Badlands National Park and the Bad River Ranch in South Dakota. In 1998 the Blackfeet Nation of Montana, together with the Cochrane Ecological Institute and the Defenders of Wildlife began a restoration project of the swift fox to Montana. The Institute had the only swift fox captive-breeding facility in the world. While the Defenders of Wildlife provided the funding for the project, the Blackfeet Nation provided the land. By the year 2002, 10 dens had been documented, and the population was growing. In addition to returning the swift fox to the land, efforts were also made to re-establish the swift fox's food source of prairie dog and black-footed ferret populations. Their goal is to establish a self-sustaining population of swift foxes in the region. After determining that re-establishing the swift fox would not have an adverse effect on nearby ranchers, The Badlands National Park in South Dakota released 30 swift foxes from Colorado into the park in August of 2003. Their aim is to release 30 swift foxes a year into the park and the surrounding Buffalo Gap National Grasslands until 2005. There are already large prairie dog towns and other rodent populations that will provide shelter and food for the swift fox to get established. Private efforts are also proving very successful. Ted Turner, the owner of several large bison ranches in South Dakota and a member of the Swift Fox Conservation Team, set up the Turner Endangered Species Fund. In 2002 swift foxes were introduced to his 138,000-acre Bad River Ranch, just east of the Badlands National Park. Studies showed that the ranch could support a self-sustained population of 200 swift foxes. The Livestock Advisory Board approved the return of the swift fox to the Bad River Ranch. The South Dakota Stockgrowers however, have voiced concern that approving the plans could set a precedent for the later introduction of larger carnivores like wolves and grizzly bears. Biologist Mike Phillips, who oversaw the reintroduction of wolves to Yellowstone Park in the 1990s, says, "Badlands and Bad River are the first beach heads, but for this to work, you've got to have more than beach heads. You need human cooperation. You can have all the habitat in the world, yet unless people are willing to consciously make room for wildlife in their daily lives, we'll continue to repeat the old patterns that caused problems."